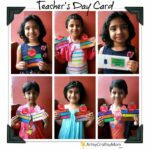 You are here: Home >> Holidays >> Teacher's Day >> 20 Awesome Teachers’ Day card Ideas with Free Printables! Teachers have the hardest job in the world..sometimes we have no idea how much time, love and preparation go into planning for our kids to have a good education! Take a few minutes to say Thank you. 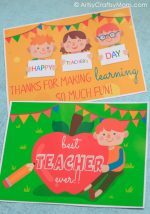 Here are just a few easy homemade Teacher Appreciation card ideas that I have gathered from across the internet to wish that special person in our child’s life. Fold a long strip of paper accordion style 9 times. Then in each fold paste cut outs of the word THANK YOU. Our Pencil shaped Teacher’s day cards are sure to be a BIG hit! Print, fold, color & you’re done. 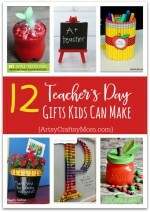 The little ones will love making this and gifting their teachers. Free printable template for the card is available here. Do you need a little something to give to those teachers with whom your little darlings spend so much of their day? How about a handwritten note inside of a handmade card using the Head of Class collection by Little Yellow Bicycle! Plus free video tutorial inside! Let your little ones show their teachers how important they are with these easy-to-make teacher appreciation thank you cards. 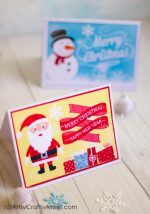 This simple card is perfect for preschoolers & kindergartners to make and gift. All you need are crepe ribbon scraps. Stick away. Full instructions in the post. Click image for details. Make a Teacher’s day hand print flower card. It was made for Teachers day but it can surely be used for other occasions too . ” What a sweet surprise your teacher will have to get this card! Make a pretty fingerprint card with your kids for Teacher’s day. Not only is it cute but it’s fun for the kids because they get to have their fingers messy! Line a black craft paper card with craft sticks and paste an apple. We love this creative card! 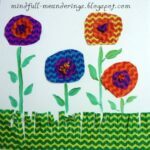 Use a mix of materials – pipe cleaners, stamps, and construction paper – This Apple card via CraftProjectIdeas is super cute! We made this Accordion fold butterfly card for a different project, but it can be converted into a Thank you card for a Teacher too. They would be great to attach to a gift with a message expressing your thanks or they would also be great to give as a blank set of note cards to your child’s teacher for their own personal use throughout the year – just print off a few copies & pair them with envelopes to create a note card set. Kids can create beautiful handmade Thank You cards using a wax resist art technique. A white crayon and some watercolour paints are all you’ll need! I personally think teachers and mums do the hardest jobs in the world so thank you cards are a must! Great ideas. Love the Crepe paper roses and butterfly card. Very Beautifullllllll Ideas… Luv to Ccccc…. Your blog is filled with lovely ideas. I really liked it. I too made a greeting card for my kid school project using vegetables to paint. I would love to share it with you. My kids loved making the pencil shaped card for their teacher.